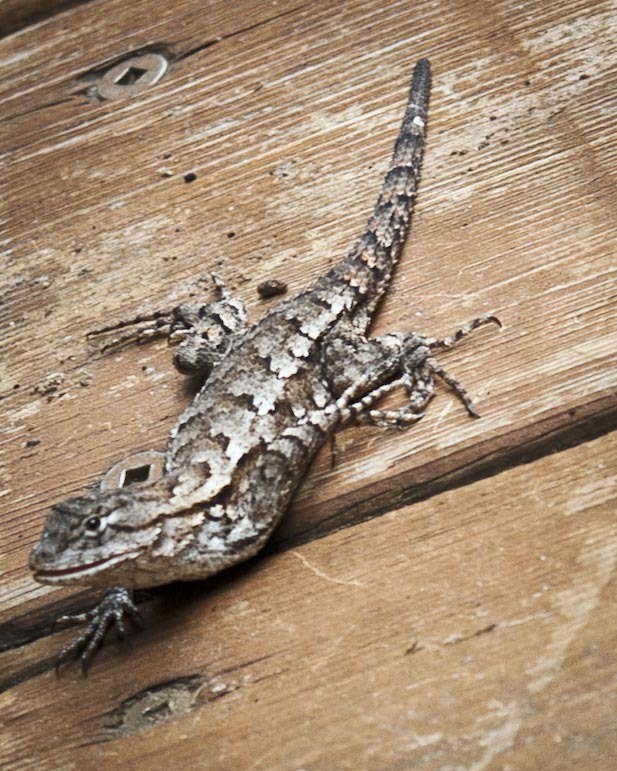 This Eastern Fence Lizard was a new species in our yard this year. Happy Last Day of 2012, everyone — unless you live in New Zealand or other countries where 2013 has already arrived. Here in my patch of southeastern US Piedmont, we were treated to a spectacular final sunrise of the year. A cold front is just arriving from the west, and a high-altitude wind is pushing herds of puffy sheep clouds across the sky from west to east. When I looked west early this morning, the silvery sheep were nearly invisible in a lilac sky. But as I followed the herd across the sky to the east, they began to glow pink, as light from the rising sun reflected on their undersides. Turning to the ridge line that marks our eastern horizon, the sky was aflame with deep reds and oranges, reflecting fire onto the water of the creek. The cloud sheep in the east were peach and pink puffy masterpieces. Along the far south horizon, one sliver of vivid turquoise colored the sky where clouds had not yet arrived. The sun topped the horizon, and the colors muted to pastels as the sky directly above me deepened from lilac to azure. An eye blink later, the show was over as the sheep coalesced into a solid sheet of gray. The rain won’t arrive until tomorrow, so the weather seers predict. The blanket of clouds will keep midnight revelers warmer than last night. Temperatures here fell to nineteen degrees Fahrenheit before the clouds showed up. Personally, I think a wet start to the new year is most auspicious. The drought here has lingered for most of the past decade. I estimate it would take an inch a week for the entire year to bring my area back up to the water levels it once enjoyed. Here’s hoping we all get the weather we need in 2013. Meanwhile, the folks at WordPress have been hard at work crunching year-end statistics for my little blog. As I did here last year, I thought I’d take a quick look at which posts you folks read most frequently. First, let me remind you that I began this blog in January of 2011. Today’s post makes the 251st entry since I started. For 2012, this is the 73rd new entry. These new entries include 460 new photos. This year, the day with the most page views was March 29, when the blog attained 208 views in one 24-hour period. I have no idea what happened that day, but I suspect someone in the Webiverse with readers linked to this site, resulting in the astonishing increase in traffic. The most popular post that day was a piece I wrote about my Loropetalum shrubs. 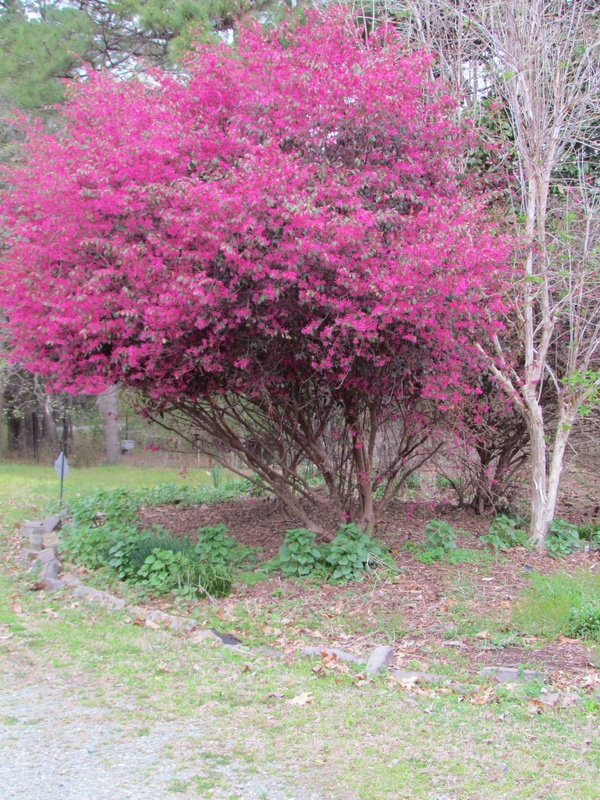 Here’s the link, and here is that often-viewed photo of one of the shrubs in full bloom. It does make quite an impact, doesn’t it? 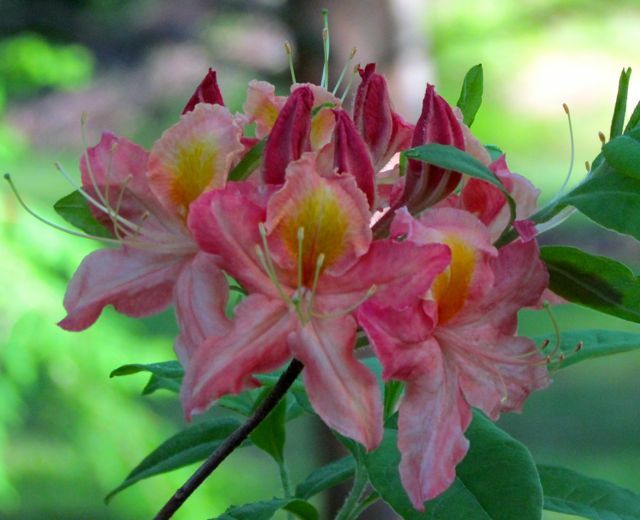 This year, the most frequently viewed entries were all posts I wrote in 2011, and all but the first one dealt with specific plants in my garden, which reinforces the fact that most of you find my blog while searching for information on specific plant-related topics. How many four-leaf clovers do you see? — 542 views — I think folks just love to count them out. How to garden during a 100+-degree heat wave — 177 views — I think the harsh weather this past summer in North America, and the continuing drought/heat issues in Australia explain many of the views of this entry. Personally, I was gratified that my posts on invasive exotic species were sought out frequently. This issue will only increase in significance in the coming years, so I’m glad folks are starting to pay more attention to this growing threat to our native ecosystems. At this moment, my blog has been viewed 46,952 times since the first entry — 11,732 views in 2011, and 35,220 views in 2012. Average views per day in 2011 totaled 33, but climbed to 96 views per day for 2012. I think this is pretty good for a blog I’ve never advertised. I attribute the increased numbers to diligent tagging, enabling search engines to find relevant posts. I can’t end this retrospective without acknowledging the amazing self-described “happiness engineers” at WordPress. Their work to continually enhance and improve the functionality of their blogging software is most appreciated by this writer. Just this month, they’ve added a new statistic to the mix. I can now differentiate between the number of daily visitors and the number of daily views, thereby allowing a calculation for average views per visitor. Most interesting! And I must give a shout-out to Happiness Engineer Bryan, who through a series of e-mail exchanges, politely and patiently walked me through how to use some new functionality their interface now offers. Thanks again, Bryan! And many thanks to my readers, especially those of you who take time to comment on my offerings. It is gratifying to know that sharing my gardening obsession is perhaps of some utility to others out there. I hope we can continue to help each other as weather challenges mount and new plant varieties arise. Of course, the imminent arrival of a new year also brings a new gardening season. I’ve already placed my seed/plant orders, and I’ve been mentally building a to-do list so that the garden will be ready when planting time arrives. I’ll share my thoughts about all that in an entry next year. Meanwhile, I wish all of you a Happy Gardening New Year! This entry was posted on December 31, 2012, 9:03 am and is filed under piedmont gardening. You can follow any responses to this entry through RSS 2.0. You can skip to the end and leave a response. Pinging is currently not allowed.